Years ago, I wrote an adult novel. It was the first long piece of fiction I had written, and it wasn’t very good. I loved writing it, though, and I loved the setting and some of the characters. So I decided to set my next YA book in the same place—the coast of British Columbia—and I “invited” some (but not all) of the characters to wander over for an extended visit. 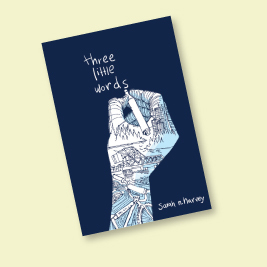 The result is Three Little Words, a book about sixteen-year-old Sid, a foster child who has lived very happily with his foster parents for fourteen years. He has only the flimsiest of memories of his mother (and has no idea who his father is). A talented artist, Sid is happy to spend his summer days drawing, swimming in the lake with his best friend Chloe and helping out with Fariza, a new foster child with a terrible secret. When a stranger comes to the island and asks to speak with Sid, his life changes in ways he never imagined (or wanted), forcing him to re-consider the things that are important to him: family, friendship and love.